Solicious StoriNori: ww | Siapa sudi belanja saya ? ww | Siapa sudi belanja saya ? “BUY 1 Chicken Foldover a la carte & Get 1 For Free” from 12 – 25 July 2012. More great news! 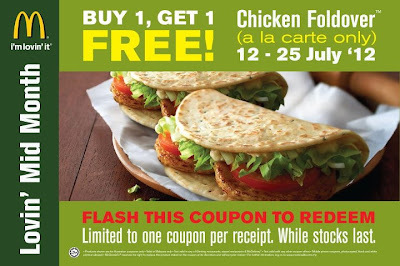 Now, you can flash the coupon on your mobile phone at your favourite McDonald’s restaurant to enjoy this special offer! You can also print out the coupon to redeem. The choice is yours.